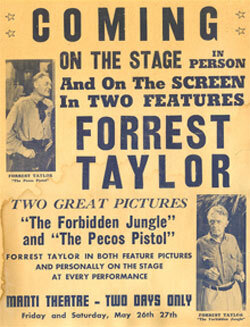 Veteran heavy—and sometimes father figure—Edwin Forrest Taylor began in films in 1915. Born December 29, 1883, in Bloomington, Illinois, his father (Christopher C. Taylor from New Jersey) was a prominent newspaperman. Taylor spent a few years in publishing before turning thespian with his first picture an Art Acord western for American, “Man-Afraid-of-His-Wardrobe” (‘15). Billed as E. Forrest Taylor, he starred in at least three more 2-reelers for American and at least 5 Mustang 2-reelers, all in 1915. In 1917, he deserted movies for the legitimate stage, working as a leading man with Clara Kimball Young, enjoying success on Broadway in “The Fool” (‘22), “In Love With Love” and “Nervous Wreck” (both ‘23) and even heading his own stock company for seven years. 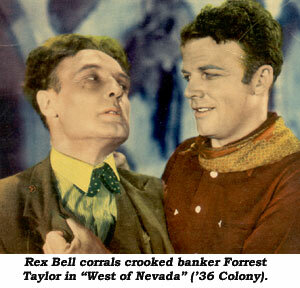 Although he’s in “No Man’s Gold” (‘26) with Tom Mix at Fox, he returned to his screen career in earnest in 1933 (“Death Kiss” with Bela Lugosi, then “Riders of Destiny” with John Wayne) and worked opposite virtually every western star for the next 26 years, retiring in 1959. His malevolence was at its best in the ‘30s when Taylor employed his gray-haired “fatherly figure” outwardly to disarm all around him while he plied his evil schemes with his henchies. In this type of role, viewers were never quite sure at first, because Taylor was often cast simply as a down-to-earth, honest father or uncle. As a matter of fact, by 1950, now in his late 60s, he’d pretty much shed his bad-guy image for strictly father-sheriff-doctor-townsman roles. 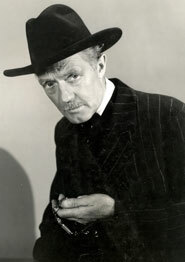 Some 350 films boast his name as well as dozens of TVers including a recurring role as Doc Brannon on “Man Without a Gun” (‘57-‘59) which starred Rex Reason. 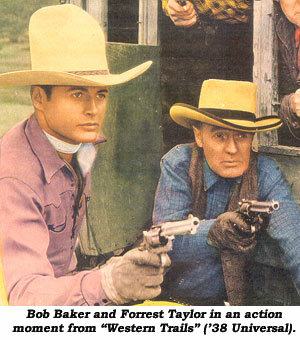 Taylor also starred as the family patriarch on the long running religious TV series “This Is the Life” (‘52-‘56). His last appearance was as a minister in “The FBI Story” (‘59). In serials, some 35, he was the most prolific chapterplay “pawn” or “suspect” in “Fighting Devil Dogs” (‘38), “Iron Claw” (‘41), “Manhunt of Mystery Island” (‘44), “Crimson Ghost” (‘46) and others. He arranged his own kidnapping and was revealed in the final chapter to be the mysterious Recorder in “Bruce Gentry” (‘49). He’s also in “Shadow of Chinatown” (‘36), “Lone Ranger Rides Again” (‘39), “Green Archer” (‘40), “Terry and the Pirates” (‘40), “Overland Mail” (‘42) and others with his last being “Lost Planet” in ‘53 for Columbia. Taylor never served in the military. He was married to Ann H. Taylor with at least one son, Jack F. Taylor. The Taylors resided at 8111 Stanford in Garden Grove, Orange County, California. One of the kindliest appearing but most deadly screen heavies, Forrest Taylor died February 19, 1965, at 81, while a patient at Palm Harbor General Hospital in Garden Grove. Cause of death was pulmonary edema and congestive heart failure. He’d also suffered from emphysema. Taylor is laid to rest at Forest Lawn, Hollywood Hills Cemetery.